I will keep it short so that you could focus on what it is important. However, I want to congratulate all the authors who published in the March issue of our literary magazine. They brought us joy and they surely mesmerized the readers, considering the number of readers we had last month. THESE AWARDS INCLUDE READINGS THAT WERE NOT INCLUDED IN THE NORMAL MONTHLY AWARDS, AS THE RESPECTIVE WORKS WERE READ AFTER THE COMPETITION ENDED - THEREFORE, THE NUMBERS OF READERS WILL NOT CORRESPOND WITH THE NUMBER INITIALLY MENTIONED NEXT TO THE AWARDS! We thank you all for sharing your work with us! I, too, want to add my thanks to Roxana Nastase and the entire editorial staff. 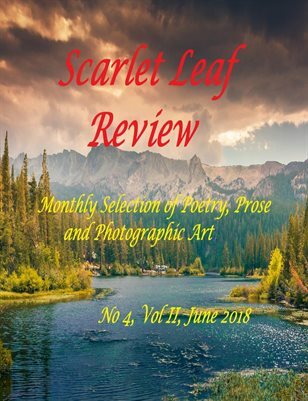 There is a great deal of had work, time and concern reflected in the high quality of the Scarlet Leaf Review. I greatly enjoy and appreciate the effort reflected. Thank you, sincerely. I would like to express my heartiest congratulations to all the winners on their success. I also wish to express my gratitude to the editors of Scarlet Leaf Review for their strong attempts. Thank you to all of you for your kind comments.